“Fifty minutes! Behind the next car! What a lousy time”. Stated Gregory Durant, “Jim, you better get this car under control next time”. “Look. It’s a fun Italian cruiser. Rally car, no”. “Yes, but it was Ray’s decision to focus on the power, not on handling”. Jimmy started to leave the room, when he turned back. “He’ll stay, but I know one thing”. “Ray Lemont will not design another car for Redmond Racing”. Oh, @Private_Miros, at the different stops, is modifying allowed? Looking at the total times, I’m surprised that Runabout has better score than Hurja. I’m also almost shoked to see Kulkuri Special being above Familyman. I was expecting Hurja being the highest scoring car, followed by Familyman and Runabout, and Kulkuri being somewhere further back, and Kulkuri Special even further behind. The smaller and slower Žnopresk won the first place overall. Wonderful! After this brief discussion, the team retreated to its garage and began preparations for the next stage of the rally. No, that would be a bit too much of administration from my part as well. But the terrain is different in the shorter Stage 2 and the sprint-like Stage 3. So, don’t dispair if a car didn’t fare well on the gravel climb and the icy roads. As I said at the very beginning, a small car with limited but usable horsepower is better on twisty roads than a big car with a big heavy engine. 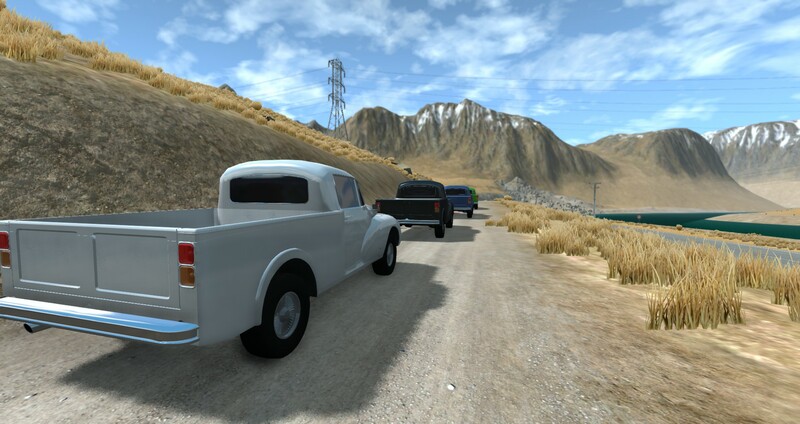 These 50’s cars don’t have the grip, rigidity or brakes to makes use of the power the bigger engine offers. With modern cars things would be different, because you can basically point and squirt. In general the lighter cars have performed well, and the fastest times were still set by rear-wheel drive cars. Those with more power that performed well are generally those with lots of low end torque, so you can shortshift or take corners in high gear and not suffer wheelspin. Generally the worst performers were those with bad suspension tuning and/or lots of power in the high rev range, but relatively little in the low range (leading to nothing, nothing, nothing, nothing, sudden wheelspin). Quite honestly I was expecting that too even thuogh I didnt know what kind of stages we would exactly be driven. Soon as I figured that the stage 1 is essentially outer loop of Automation test track, I expected that Runabout and Familyman doing well on gravel uphill and Kulkuri and especially Kulkuri Special to suffer there. and from hurja I expected that it would be “somewhere in between” them. From top of the hill I expected that Runabout might shine there, how ever the part with ice patches isnt very long I didnt expect it to get too massive lead to others. From downhill and final stretch I expecteed Hurja to catch up the others thanks to it’s better suspension and power advantage on the straight, Specially as it wasnt really damaged. How ever I didnt expect anything groundbraking, Just enough to pass them. The largest surprise to me is Kulkuri Special being faster than Kulkuri and even beating Familyman. #22: almost certainly fully buggered up by the crash on the final sector. Yeah, sorry, #22 is one of three cars totally out. well, back to the factory to repair it for future, more fully road oriented, competition. Wow, congrats to the Bogliq coming 3rd overall so far! Fingers crossed for the next stages. Wow, the arkani is doing very well. I didn’t expect it to be that fast! I mean, Near 200km/h on those roads must be scary as hell! I remember 3 cars reaching 200 or over. Ok. Thanks for clarifying! Good luck on stage 2. Manager: "how many of those 2000 pickups do we have spare at the Fruinia Plant? 1 day later, marcel returns with 12 spare 2000’s which are given to local farmers and craftsmen. Stage 2 (“mixed stage 1” on Utah) of the Corso is a shorter stage and goes from Fienna to the capital, Coma. From Fienna, the Corso follows swooping roads in the hills down to the South. A few mountains need to be crossed, but no great height differences generally. The road surfaces are paved, but not always of the best quality. Drivers should be looking out for potholes and rocks on the sides of the roads. At a village called Orta, the Corsa takes the back roads towards Castello di Frui; dirty unpaved roads along the Timero river valley, with some drastic elevation changes here on very rough and uneven surfaces. Past the dirt roads, modern highway appears, with the last stretch towards the Fruinian capital Coma. One thing we noticed here, is not to trust any Fruinian bridges. This happened a few times, but of course the car got another run then. 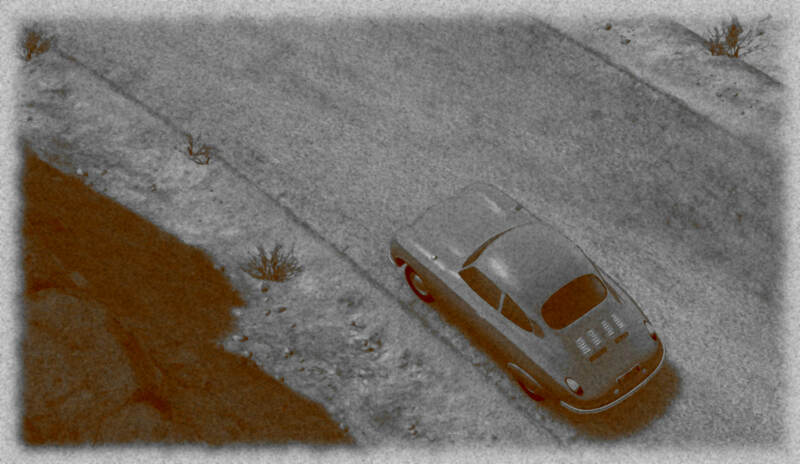 Except one car (not the one in the clip above), which had this 5 subsequent runs, each time having restarted the game. I then restarted my whole computer and did a 6th run and it again fell through the bridge… The next car did not have any issues at all immediately after that. So I conclude fate hath decided for that car. Sorry for the DNF there, but luck was clearly not on your side. No issues for Godini from the PMI Polloi Barudion Aero “Corso” on the first stretch of this stage. An unusual environment for the prototype Suzume Kaikyu San Ebi Kei car these flowing twisty roads. The small 360cc car manages well enough in terms of handling, but the stresses of high speed downhill sections are a bit too much on the small engine, necessitating more than one service stop. Solid start from the #89 Epoch Model 10C Modifica. Where the 500cc had issues to climb over the Arpeninos, the engine is more than sufficient to sweep around the roads between Fienna and Orta. That the KMC 800 Roadster has oversteer issues was already noted. Whether it is luck or skill to limit those oversteer moments of the #63 car to where there is room to have them and not fall down a gorge, that is up for discussion. Certain is though that the last of the spins seems to have caused a tyre to burst which needs to be replaced before continuing towards Orta. The 17 horsepower Marcello Tipo 300 is unlikely to encounter much issues on the flowing paved roads of Fruscany and Fruinium, the two provinces this stage takes us through. That does not mean the car is spared completely of trouble, as a stop to clean out the air cooler unit shows. Wearing earmuffs the driver of the CMW S946 Bergmann Special is ready to leave for the second stage of this Corso. This is the noisiest of them all, I’d say, an aspect that caused time loss up in the Arpeninos with the horse-incident, if you remember. 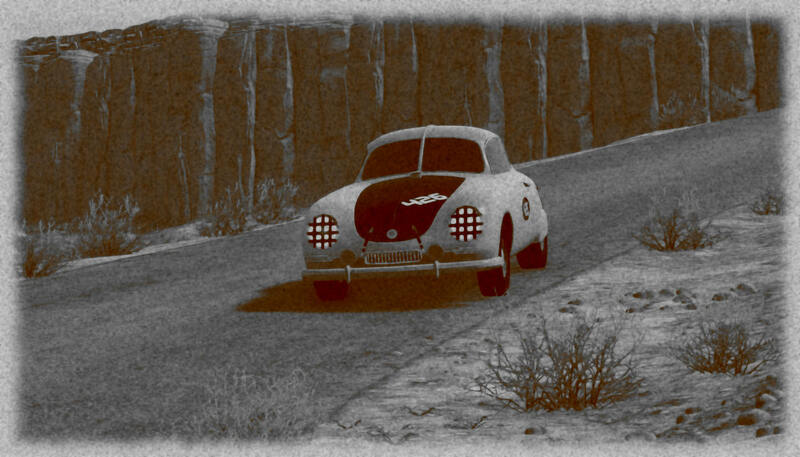 It’s clear early on that the swooping roads, even with the bumps, suit the CMW very well, however, about halfway to Orta, the engine breaks down – luckily just a loose throttle body. Since there’s only a driver and no mechanic in the CMW, the repair – certainly when the engine is as inaccessible as it is in the mid-engined CLW, this is taking some time. 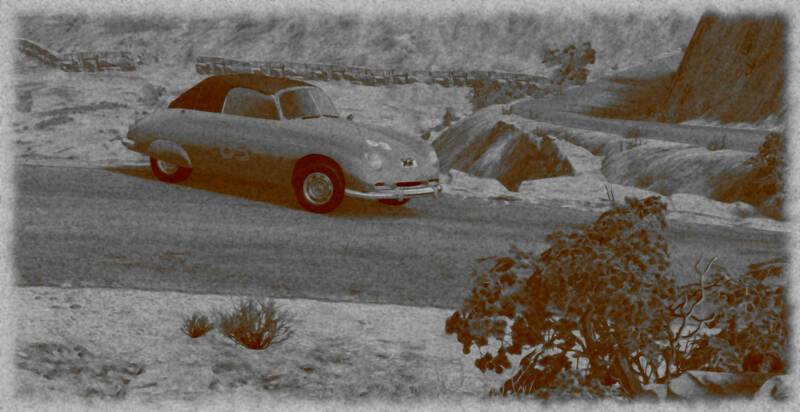 It remains a technological marvel for the time, the Juggernaut Automotive Runabout and its front wheel drive system. There aren’t many on the market who run so smoothly and so well in line with its engine. With only a 750cc four-cylinder it isn’t quick, yet neither could you call it slow. Hopefully this time a run without steering failure or failure of any kind for the Barato Motors 800 Sport Race. The #54 car has one of the most expensive and highly-tuned engines in the field. There were worries before the first stage that the engine would simply disintegrate on itself, but so far so good. The Condo Sprint with number 93 had some understeer issues in the first stage. The start today looks promising though, perhaps Hill and Collins have worked on the steering or the traction system in the last one and a half days. An alarming crush when cutting a corner can be heard close to Orta, but the car continues seemingly without issues. From the company at the coasts of the Adriatic, the Znopresk Z849 continues to impress with its acceleration and speed for such a small car. The drive does not always look very comfortable due to the shaking of the car when the chassis is put under stress – which is often on this Corso. Unhappy faces at the start line with the #46 Aeros Shrew. We heard the issues in the first stage were due to too wide tyres, protruding from the wheel wells, but no solutions could be found. But unexpectedly considering those previous issues, the run up towards Orta actually goes pretty smooth. The more flowing roads and decent asphalt are much easier or the wheels of the car. The local boys know these roads by heart, but the question is if Martino and Rizzo can turn that knowledge into an advantage with the rather rickety modified Giusseppe G220. The start where a couple of by-standers and Rizzo push the car to get going is turning a bit into a ritual, with Rizzo jumping in the passenger seat once it gets going. The LSV Mark RS has proven to be fast and sturdy in the first Stage and the team will be looking to confirm. A pigeon of all things is the saboteur not far from Fienna, as it smashes against the front window and breaks it, forcing the team to stop and clean out glass and feathers from the interior. Wisconsin Motors is leading the manufactures ranking and is hoping the experimental, but cheap, three-cylinder in the WM RatonAereo 654 will hold up. The drive towards Orta at least goes smoothly, the car feeling at home on these twisty roads. Continued bad luck for the Cisalpina Superleggera 750 as technical issues plague it from the very start of this stage. None of the problems is critical, but overheating, shifting suspension bearings, a stuck brake pedal,… all cause of worry and delay. 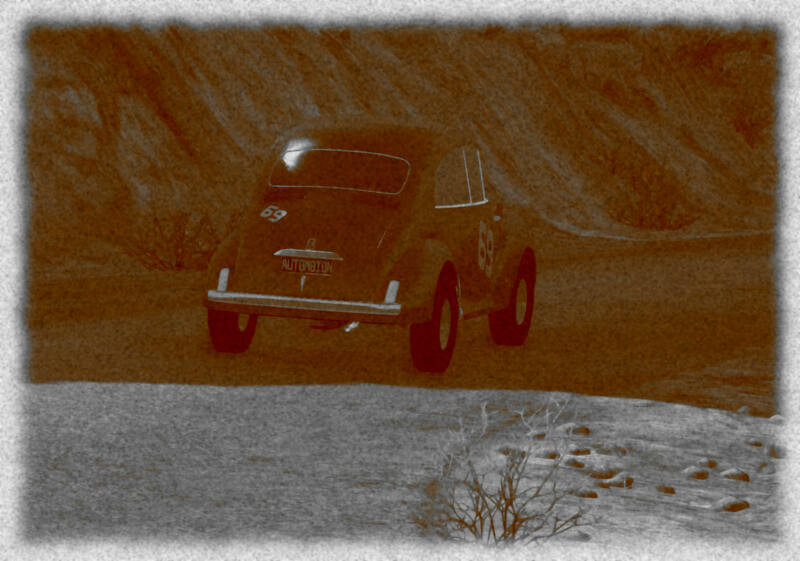 The Merciel Modele 1949 Modele 49 Course '49 is hoping to keep its small lead on that other extremely cheap family car, the Marcello. With half the engine more in displacement, that technically speaking should not be an issue. In the run towards Orta it appears as if the driver is struggling with the heavy steering of the little car; not ideal on these bendy roads. Sturdy, nimble and well-planted; that was the impressions the Birmingham Snake Van Custom left last stage (on us, the impressions on the village of Arpeninetto were of a different nature, though not a lesser one). However, coming over the hills towards Orta, the van turns in too hard in a hairpin and gets stuck with its front wheels in some rocks. It takes considerable time to get loose again, with the rear-wheels spinning half of the ground. By the time they manage to get the van back on the road, the engine is overheating. Tackling a bunch of corners next, the fast, but decidedly not bent on bends Penrose Customs 800. And, as expected, the #92 car understeers and jerks all over the place. 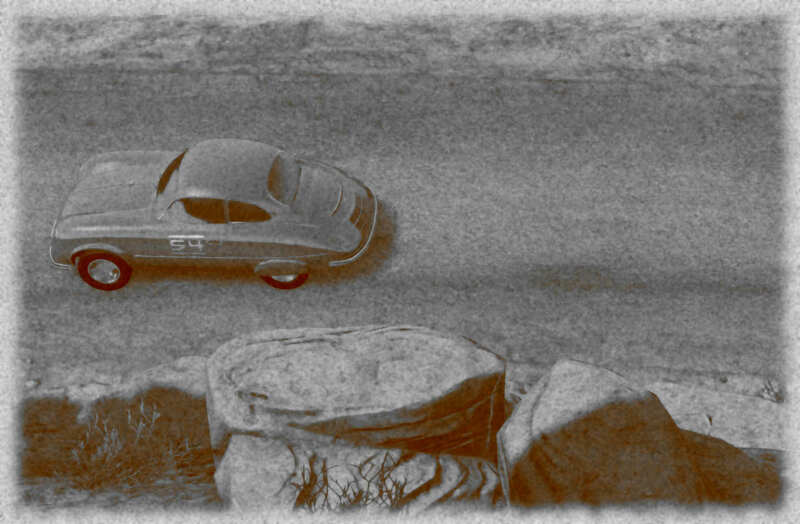 On these narrow twisty country roads, that is a bad combination, and about halfway to Orta, the front rights clips a rock next to the road at high speed – the car having slightly veered off course in mild corner. Closing the class is the #60 Ceder Abeille 760. The car might look pedestrian, but the pace is not. Some time is lost though as the clutch acts up.